To be honest at the start, I've never been a huge fan of Steve Miller Band, even though, back in the day, I had his three most popular albums in high school. (In those days you bought anything that was hip if only to stay popular with the girls). Very few songs resonated with me. Too much like Top 40 pop fodder for the masses, I guess. 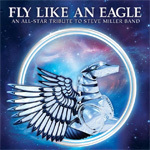 Well, here's Fly Like An Eagle, the all-star tribute to the Steve Miller Band, produced by the ubiquitous Billy Sherwood for Purple Pyramid Records. Sherwood has rounded up a myriad of 'all-star' musicians for the project, as he's so very good at doing. Artists include Peter Banks, Rick Wakeman, Tony Kaye, Colin Moulding, John Wetton, Steve Morse, Steve Hillage, Fee Waybill, Rod Argent, Sonja Kristina, Jordan Rudess, Steve Stevens, Joe Lynn Turner, among others. Like other Sherwood produced tribute albums, he uses a different vocalist for each song. The songs are basically the Steve Miller Band's greatest hits: Take The Money And Run, Jet Airliner, Living In The USA, Swingtown, The Joker, Fly Like An Eagle and more. Bring a tribute album essentially means the artists get to give their interpretation of the song without losing the principle melody or the distinctive character of the song. For the most part most every song sounds like an SMB song, though I can't say that they all that interesting. Living in the USA, featuring Tubes' Fee Waybill, is rambunctious, but ultimately ends up sounding like a Tubes song. The Joker gets hammered by the simple lack of enthusiasm. Take The Money And Run, with Colin Moulding (XTC) on vocals, also doesn't seem to have the punch of the original. Alternatively, John Wetton does a fine job with Jet Airliner; Nektar's prog synthesizer styling boosts Fly Like An Eagle; and Sonja Kristina of Curved Air is beautiful on Winter Time, possibly my favorite SMB song. Considering my initial comment at the start, others my listen to this album and hear things differently. I would be curious to hear what Steve Miller himself thinks of this; I'm guessing he would like it. And if you're a fan of the band, you'll probably like it just as well. A collection of talented musicians interpret the greatest hits of the Steve Miller Band on this interesting tribute album.